The slow but steady swell of a proverbial tidal wave of holiday activity has started in earnest at the Marketman & Family household. We have traditionally made a big deal out of Halloween, what with a kid in the house for these past 13+ years… Her first costume was the cutest ever Winnie-the-pooh in a terry like fuzzy fabric, made by a tita of hers, and she waddled around the block complete with pampers that made her rear end look like that of a well-fed/stuffed bear. Her costume choices since then have obviously evolved and become more sophisticated, but now it isn’t about the costume, just about hanging around with friends, I suppose. She’ll still get a ton of candy I suspect, but it probably isn’t too cool to admit that at her age… :) After Halloween comes Thanksgiving, holiday parties, dinners, etc. and of course Christmas, an absolute family favorite. So today I was at the Manila Seedling Bank in Quezon city and noticed that Puentespina or Waling-Waling still had an abundance of decorative gourds at PHP200 a kilo, some 50% less than groceries and retail outlets that carry the exact same item. I picked out about 20 pieces and since they had so many, I really got some nice unblemished specimens. 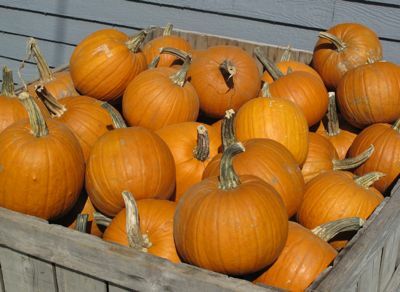 They will last several weeks and make a nice, colorful Fall themed centerpiece. 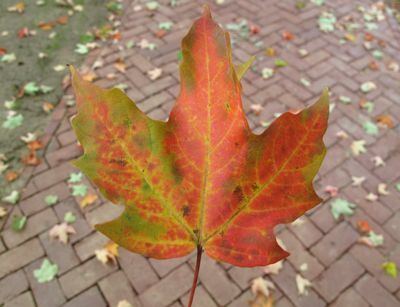 Albeit a temperate region’s “Fall” centerpiece. They are resting on a some “curtain vines” also from Puentespina and the container is a homemade four section tray made from an old jackfruit tree that came from my lola’s backyard. The unusual shapes of the gourds and vibrant creams, oranges, greens and mixtures of all three really make an interesting arrangement. They are striking when laid directly on two wooden tables made from tindalo and kamagong wood that combined serve as out dining table. I calculated the per piece price of the gourds, and the locally grown ones came out to roughly PHP30 or less, which was surprisingly 33% less expensive than similar gourds I spotted in a New England farm store just a few weeks ago, photo above. I didn’t manage to find any large pumpkins at Puentespina today; they had already been picked over, but these cute specimens above from the same New England farm store would have done nicely, if only they didn’t weigh so much! And imagine bringing foot traffic to a virtual halt if we had these 775 pound pumpkin monsters on the front lawn! The last amber, orange, ocher, golden and red leaves must be falling off the trees by now… Time to run off to the grocery to get lots of candy for the kids who come by to trick or treat, we usually prepare for as many as 1,500 or more! 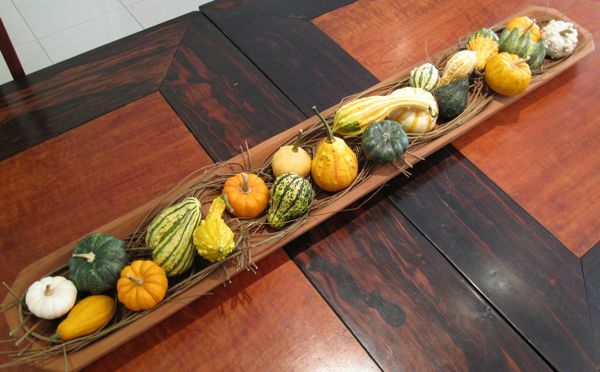 I found decorative gourds like these in SM for I think Php120. But…I forget if they were for the half-kilo or one kilo. But nice touch MM! Happy Halloween to Everyone! Have a nice TREAT. 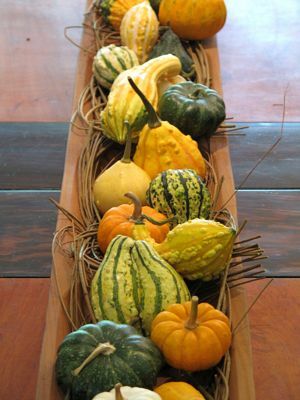 Very nice presentation of pumpkins & gourds. Thank you for sharing. 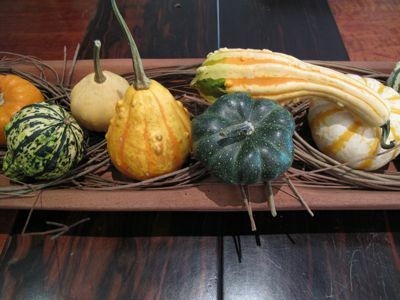 The decorative gourds were also at 200 pesos per kilo in Landmark Supermarket in Trinoma. Saw them yesterday when we did some grocery shopping. South Supermarket carries those decorative gourds for P200/kilo. They don’t have much but it’s still a lot cheaper than other places. I remember S&R selling them per piece! What did you give away for trick or treat this year? Actually the leaves are just peaking in colour right now after a chilly spell a week or so ago. Looks like the best fall colour in a few years, I think. :) Geese are flying south in huge honking V’s. Speculation is that this will be a hard winter…we shall see. Those mini pumpkins are edible. You could scoop them out after Halloween and bake them with a filling. Nice arrangement, now all you need is cold weather. 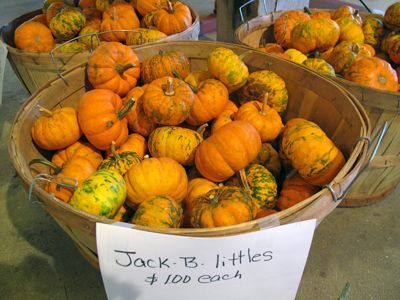 Ah, Fall in her hues of red, orange and gold; gourds and pumpkins and the days grow cold. I’ve always been more alive and happy in Autumn than any other seasons of the year. So good to know gourds and pumpkins are available in PI. And yes, all you need is cold weather. 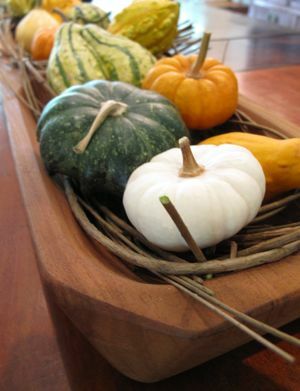 Gorgeous fall centerpiece MM! Now since Sister says they’re edible, can’t wait to see what you do with them after Halloween. Happy Halloween everyone! I have the same gourds you have altho not as many, and a couple of colored corns. And yes, autumn color is at its peak and just gorgeous. Next Sunday, daylight saving time ends and we will get an extra hour of sleep! And Halloween is coming although, I very seldom get any trick or treaters as we live in the country and neighbor’s children are all grown up. Also, now the malls are offering a safe way for the kids to go trick or treating.Is it the same way back home or in other countries? I love the container for the gourd, MM! Very nice! wonderful post! and maybe after halloween, we can expect a post on pumpkin soup. yum! Hi MM! :) Love your blog about Halloween. I have an American bf and he’s been missing pumpkin pie especially since Halloween is just round the corner. Any idea where to get it here in Manila? can you cook and or eat these?